Stunning panoramic views from this beautiful 4 bedroom, 3 full bath, Alii Shores remodeled home. 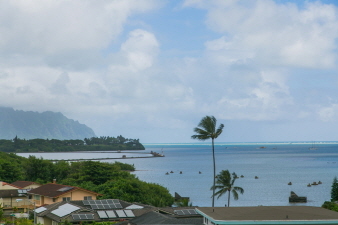 Enjoy the ocean and Koolau Mountain views from the upstairs deck which is perfect for entertaining and evening sunsets. Home features 2 bedrooms, 2 baths at main level, new flooring, newer kitchen, double pane windows, and high ceilings with recessed lights. Spacious floor plan with upstairs additional bedrooms, bathroom, family room, and wet bar offers multi-family living. Over 600 sq. ft. garage with extra storage and workshop. Lovely koi pond and tropically landscaped yard to enjoy. Private and secure with electric gate, fenced yard, and beautiful rock walls. Owned 34 Photovoltaic panels with net metering for low HECO bills. Attention to detail and pride of ownership throughout!